Okay, okay, so just like everyone else I used to hate those Magic Happens bumper stickers but the title really stuck for this photo. Again this photo is about 5mths old but I just love it, I was down south at my favourite beach (which is just to the left of this) chilling out when I thought I’d take a chance and see if I could get a good shot of these rocks. I was really pleased with the results. It was just so relaxing and refreshing sitting here watch the night take over the day. I guess its one of the great things about being a landscape photographer, we don’t take these small little moments pass us by. So the title sticks ‘Magic Happens’. Anyone up for a shoot this weekend? Drop me a line. 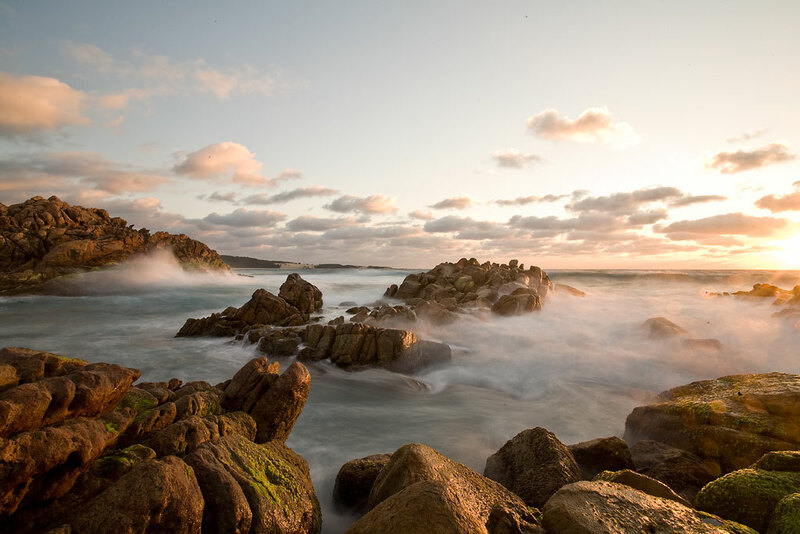 This entry was posted in Australian Landscapes and tagged australia, image, Jamie Paterson, landscape, ocean, panorama, photo, photography, seascape, south west, sunset, water, western australia, yallingup. Like the soft colors with it the rocks look great . Just wondering if those little black spots were senors dust ? Yeah will be keen for a shot this weekend let me know if your heading out . Yeah tomorrow morning would be good . Any idea of any locations ? What black spots? 😉 Where to shoot? That is the million dollar question isn’t? What suburb you in? I’m in Mt Pleasant. Love the water movement Jamie, we gotta get back down there when the tide is in next time. I did not see any black spots either, but then again I have been behind the computer all day so pretty much everything right now is outta focas to me. There was definitely sensor dust. I removed it and was just mucking around. It was a good heads up from Kirk. I know its cliche but I’m thinking about going up to Kings Park and taking a shot of the city with the sun rising behind it. Its a good portfolio shot. Interested? No probs. See you then. If your talking about tomorrow morning I will see if I can make it up there as well! Nice shot Jamie. Good spot too, great fun scrambling over all the rocks around there. Did you manage to get out and shoot from Kings Park this morning? Get any keepers? Was good morning for it. Sky lit up nicely before sunrise. I got down to Matilda Bay and got a few shots. Hopefully they came put alright. You missed an awesome sunrise this morning. Kirk and I got some great shots. Yes I definitely got some keepers. It was a fantastic sunrise. It was funny when Kirk and I got there at 6am some tourists asked us what time the sun was going to rise and I told them 6:30am. They tought the sun came up at 5:30am and been there since just before 5am!!! Yeah Jamie when I walked outside at about 9 this morning I saw some very nice clouds hanging around! I’m a bit annoyed at myself but in Woodend where I will be this week there are great red autumn colours so I will try to make the most of them! I got a shot last night up on the blog. Nice capture, Jamie. I’d be keen to head down south with you next time you go down there… It looks like an awesome place to shoot! When are you off? Look forward to seeing what you come up with whilst you are over there. The best thing about down south is that there is so many places to shoot, can’t let Christian have it all to himself!!! Yeah I’d be keen to get some of us together throughout winter to head down there, even if we go our seperate ways in the mornings and evenings, we will still have the days to chat about our experiences and the nights to have a couple of beers / wines. I’d be interested in a down south shoot. but my dates would have to be after June 12th till around July 16th as this is pretty much the only time I could make it or anythine from August onwards. Keep us informed. I’m sure we could work out a time between 12th June and 16th July. I want to go down there in winter as there is no one there and I reckon if we picked the right spot we could get some excellent ‘mist’ photos. Thanks verey much. Yeah I could spend hours in this place just chilling out.